The Supreme Court of India observed that Public Prosecutor is not supposed to act as a post office and he is expected to remember his duty to the Court as well as his duty to the collective. Public Prosecutor in terms of the statutory scheme laid down under the CrPC plays an important role. He is supposed to be an independent person. While filing an application for withdrawal of Prosecution, the Public Prosecutor also is required to apply his own mind and the effect thereof on the society in the event such permission is granted. Supreme Court, last Friday, said that it feels that the nurses who are working in private hospitals and nursing homes are not being treated fairly in the matter of their service conditions and pay. Three Judge Bench comprising of Justices Anil R. Dave, Shiva Kirti Singh and Adarsh Kumar Goel in Trained Nurses Association of India vs. Union of India ∨s however refused to issue any guidelines in the matter, but said that grievances highlighted in the petition needs to be looked into by the Committee consisting of experts. Supreme Court on Monday, held a gift which was executed 4 decades ago valid setting aside the concurrent findings of High Court and the Trial Court. Apex Court bench comprising of Justices Anil R. Dave and Adarsh Kumar Goel in Khursida Begum (D) by LRS vs. Komammad Farooq (D) by LRS also observed that Requirement of possession is met when right to collect rent is assigned under the Gift deed. A two Judge Bench of the Supreme Court on Thursday observed that the request of the information seeker about the information of his answer sheets and details of the interview marks can be and should be provided to him by Public Service Commission under Right to Information Act. It is also observed that since there is a fiduciary relationship between the PSC and the Examiners, any information about the examiners is not liable to be disclosed. The Supreme Court upheld a Government order which notified the constitution of fresh Medical Board in order to verify and assess the disability of the candidates. Apex Court bench of Justices M.Y. Eqbal and Arun Mishra held so in State of UP vs. Ravindra Kumar Sharma. The Supreme Court on Friday, allowed the JamiatUlama-i-Hind to become a party in a suo motu PIL instituted to consider gender discrimination suffered by Muslim women owing to “arbitrary divorce and second marriage of their husbands during the currency of their first marriage”. 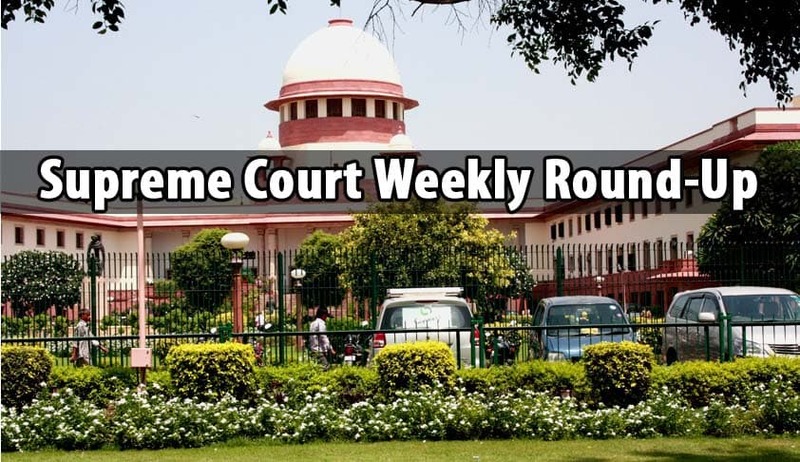 According to several reports in the media, the Supreme Court bench comprising justices Madan B Lokur and RK Agrawal disapproved strongly of the non-implementation of Food Security Act by certain States including Gujarat. In a relief to around six crore investors, the Apex Court on Tuesday set up a committee headed by former Chief Justice of India, R.M. Lodha, to oversee the refund of Rs 49,000 crores to the investors in the Pear Group Ponzi scam within six months. The Supreme Court on Monday demanded the Centre’s reply to a contempt petition filed against the Genetic Engineering Appraisal Committee (GEAC) for allegedly allowing field trials of genetically modified (GM) crops in violation of the court’s earlier orders. Supreme court on Monday, recalled a notice to Arunachal Pradesh GovernorJyoti Prasad Rajkhowa seeking his report to the President recommending central rule. The Supreme Court on Thursday, asked the BCCI to “fall in line” and implement in toto the Lodha panel report which had recommended sweeping changes in the structure, management and functioning of the Board. A special bench headed by Chief Justice T S Thakur however gave four weeks time to BCCI to respond about its stand on the committee’s recommendations and adjourned the matter to March for further hearing.